The Portable Antiquities Scheme has archived its 400,000th record on its database of English and Welsh finds. See http://finds.org.uk/blogs/centralunit/2010/07/26/another-milestone-reached/ The object in question is a coin of the House of Constantine found by a metal detectorist. The Italian Cultural Ministry and the State Department Bureau of Educational and Cultural Affairs should take note: PAS is a system better able to weather lean budgets because it relies on finders to help record objects and the State only retains for its own purposes those objects it deems significant. There are no curatorial expenses associated with most objects as these are returned to the finder and/or landowner after recordation. The idea that restrictions on collectors will further archaeological research was always a fantasy. Now that archaeology is being cut to the bone in Italy, it is only more so. Meanwhile, the UK continues to record coins and other objects with the help of finders themselves. See http://culturalpropertyobserver.blogspot.com/2010/05/pas-lets-finders-record-their-own-finds.html Isn't it better to engage interested members of the public by recognizing the interests of finders and collectors? The insular approach of many Italian and American archaeological purists only invites further funding cuts. All well and good, but one wonders somewhat about the award to Libya to help record artifacts from Cyrene. Libya is a wealthy oil state with a small population. It should already have enough money available to care for its own cultural heritage. I suppose this is all part of the rapprochement with Libya since it voluntarily gave up its weapons of mass destruction programs. Still, the timing of this award is not great, what with the negative publicity over the suspicious "compassionate release" of a Libyan intelligence agent convicted in the downing of Pan Am flight 103 over Lockerbie, Scotland. The Italian archaeological establishment is apparently due to take a large hit as part of government austerity measures aimed at addressing Italy's huge national debt. According to one report, the government will end funding to a host of research institutes, including the Institute for the History and Archaeology of Magna Graecia, based in Taranto, and the Italian Archaeological School in Athens. There are also efforts afoot to privatize a huge range of government assets, including Rome's Villa Giulia, home to the National Museum of Etruscan Archaeology (and the Euphronios krater). Some have already suggested that the cuts have gone too deeply and that a better solution would have been to merge institutions and limit privatization to less important cultural assets like beaches and ski resorts. Italy and other archaeological powers like Greece have had to take such extreme measures due to economic dislocation associated with the global recession. The impact of this news on the State Department Bureau of Educational and Cultural Affairs' consideration of the renewal of the Italian MOU remains to be seen. Most everyone likes a good glass of wine. Perhaps because I am partly of Hungarian descent, I sometimes enjoy a nice glass of chilled Tokaji. It's good to know someone at UNESCO must also enjoy a glass now and then. As the New York Times Travel section notes, UNESCO designated the Tokaj wine growing region of Hungary a world heritage site in the category of cultural landscapes. See http://travel.nytimes.com/2010/07/25/travel/25Tokaj.html And for you collectors out there, Hungary has also issued a coin to commemorate the occasion. Jack Thorpe waited long enough. He waited for Jim Thorpe the town to volunteer Jim Thorpe’s remains. He waited for Patricia to die, which she did in 1974. He waited for his three half-sisters to die, too, because they had differing views on their father’s final resting place and Thorpe “didn’t want to iron this out in public.” Grace, the most adamant about letting their father be, was the last to die, in 2008 at 86. In June, with the backing of his two surviving brothers, Jack Thorpe sued the town of Jim Thorpe in United States District Court. Citing the Native American Graves Protection and Repatriation Act of 1990, the suit contends that Jack Thorpe, as a lineal descendant, has legal claim to his father’s remains. No trial date has been set. And the town of Jim Thorpe, which slowly rebuilt itself as a tourist center with perhaps a little nudge from the dignified memorial and mausoleum for its namesake, is debating how to proceed. It will be interesting to see what the court decides. I do wonder, however, if NAGPRA's drafters would have ever dreamed that the statute would form the basis of such a claim. Hugo Chavez has decided Simon Bolivar's body must be exhumed to prove he was poisioned by early imperialist plotters. FOR a president facing a weak economy and declining popularity, a centuries-old murder mystery could prove a useful distraction. Venezuela’s Hugo Chávez is not one to let the lack of any such mystery stand in his way. On July 15th, at the president’s order, a team of white-clad soldiers and forensic scientists opened the lead coffin holding the remains of Simón Bolívar, the Caracas-born South American independence hero. He was exhumed to see if he died of tuberculosis, as historians assert, or was poisoned by political rivals—“crucified like Christ,” as Mr Chávez insists. The president has long idolised Bolívar, the nation’s secular saint. He even renamed the country the “Bolivarian Republic of Venezuela.” Although Bolívar was in fact quite conservative, Mr Chávez sees him as a socialist, and advertises his own movement as the long-delayed realisation of the Liberator’s dream. In this scheme, the descendants of the “oligarchs” and “imperialists” who purportedly killed Bolívar are now plotting to assassinate his ideological heir. In this Chavez has only followed the precedent of other dictators. Saddam wanted to associate his regime with the glories of ancient Babylon. Mussolini looked to ancient Rome. Hitler himself apparently was not all that interested, but Himmler's SS funded archaeological digs looking for the remains of ancient "Germania." And so it goes. Boston also serves as headquarters for the AIA and though the AIA hierarchy might not want to admit it, I'm certainly aware of at least some AIA members who are also avid collectors. Some of the greatest archaeologists like Evans and Petrie also collected (Evans, ancient coins,Petrie Egyptian artifacts). It is indeed a shame therefore that the AIA is now associated with an anti-collecting agenda. Collectors, after all, already share a common interest in preservation of the remains of the past. And countries like England and Wales have already shown that systems can be devised to take into account the interests of both groups. Egypt and Egyptian Cultural Policy--In Need of Change? I've never understood why many in the archaeological community are so high on Zahi Hawaas and his pharonic approach to cultural patrimony issues. Hawass and Egypt's cultural policy are both a product of a system badly in need of positive change. Kings of the [Ant-] Hill? After I pointed out that the number of "hits" each of their blogs has received may have more to do with the sheer number of posts these two gentleman pump out than anything else [as well as Gill's mysteriously funded PR Newswire releases], Gill has instead come up with a new metric for comparison purposes-- the number of subscribers to his and other blogs. But this data only tells me that the number of individuals interested enough in this field to subscribe to these blogs is rather limited. Of course, that is not to say that people are disinterested in issues that may impact them specifically. Indeed, almost 2000 coin collectors faxed CPAC about their concerns about the renewal of the Italian MOU in the two short weeks allowed for public comment. 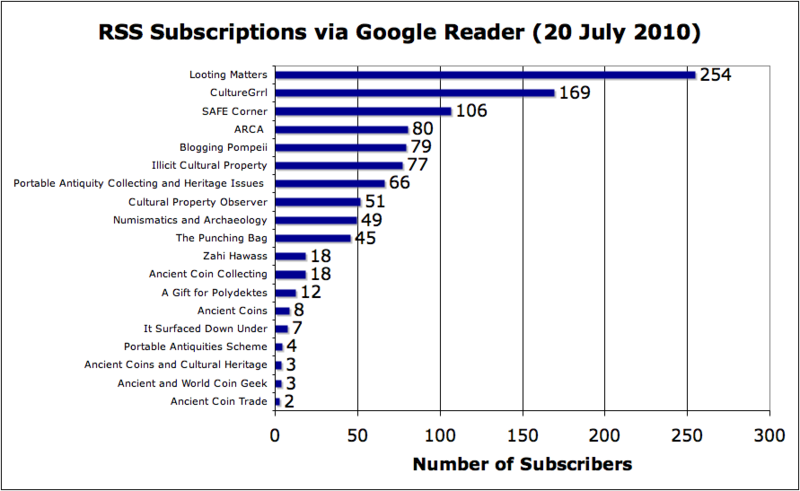 I'm grateful for "Cultural Property Observer's" readership however small in absolute or relative terms, but I also find it a bit much to assume the number of blog readers for this and other cultural property blogs is truly significant and reflective of some greater truth. The New York Times has an interesting article about the State Department's new Digital Diplomacy. See http://www.nytimes.com/2010/07/18/magazine/18web2-0-t.html?pagewanted=1&_r=2&hpw Social media is being used to engage with the world at large. As a result, State Department employees "can’t be control freaks." Hopefully, this sentiment will filter down to the Bureau of Educational and Cultural Affairs and its Cultural Heritage Center and transparency and accountability will become more than just what the State Department preaches to others. They focus on the fact there were 20,000 objects that have been sequestered and some 300 that have been returned to Italy, apparently with the agreement [under duress?] of a Japanese dealer. These 300 objects are said to be valued at 15 million Euros. Looking at them, however, one knowledgeable collector suggested to me that this value must be greatly inflated. It would be certainly interesting to hear other opinions as to the value of these objects, i.e., if the items pictured on display look like they are worth an average value in the range of $65,000. One thing can't be disputed. Italy's continued success in gaining such returns of artifacts that are suspected of being stolen from archaeological sites again suggests that there is no need to continue the unpopular US State Department ban on the import of unprovenanced Italian artifacts. Speaking about numbers and averages, I was a bit surprised to see that my blog thanking Cultural Property Observer readers for their 50,000 plus visits has apparently helped prompt Messrs. Gill and Barford to brag that their own blogs have more visitors [or was it just Gill's 3rd anniversary?]. Good for them, but to the extent anyone cares, one might consider the relationship between the number of "hits" and the number of posts. And let's not forget the role Prof. Gill's mysteriously funded PR Newswire releases must have in directing traffic to his own blog. I only wish I had the free time these two individuals apparently have to devote to blogging, and the funding for such an effort. The ACCG has filed an amended complaint in the pending Baltimore test case relating to the import restrictions on Cypriot and Chinese coins. The amended complaint alleges new 1st Amendment claims relating to the informational content found on ancient coins. It also characterizes the Department of State and Customs as acting beyond the scope of their authority under governing statutes. The amended complaint supersedes the original complaint, rendering Defendants' motion to dismiss as moot. Defendants are expected to file another motion to dismiss the case based on the claim that the State Department's actions are unreviewable. In the meantime, State has rejected mediation in the pending FOIA appeal and the DC Circuit Court of Appeals is expected to issue a briefing schedule shortly. You might not think so based on the controversies related to the MOU's with Cyprus, China and Italy, but in fact most MOU's don't attract much attention. Such is the case with the MOU with Nicaragua, which was first agreed to in 2000 and extended again in 2005. Not that there was no room for debate. Though it will presumably be extended again, if the AAMD has its way, there will be some necessary changes. There were only two speakers at today's public session, Alcides Montiel from the Embassy and Josh Knerly, representing the AAMD. Surprisingly, though some representatives of the archaeological community were present, none testified about the MOU. It was left entirely to Mr. Montiel to argue for the renewal. He testified that the MOU should be renewed because artifacts continue to be smuggled out of the country, particularly to Spain. He also mentioned that 800 artifacts had recently been seized within the country from an illicit storehouse. He further indicated that draft legislation is being prepared for additional protection of cultural patrimony and that a dedicated police force is in the works. CPAC Member Korver (trade representative) asked Mr. Montiel if given the worldwide recession, his country will seek relief from any of its obligations under Art. II of the current MOU. Mr. Montiel indicated he would need to confer with the authorities at home about this issue. In response to a question from CPAC Member Sandy Boyd (museum representative), Mr. Montiel indicated there are registered collectors in his country. Josh Knerly questioned whether the MOU should be renewed at all, but seemed resigned to the fact that it will. He first asked whether the concerted international response requirement of the CPIA can really be met given the limited nature of the market in Nicaraguan cultural artifacts. He next urged that Article II be modified to contain specific requirements. He found it troubling that Nicaragua was apparently just starting to address its promises of years past. He also issued a challenge to the State Department to provide greater transparency about what restrictions are being considered. Although the Federal Register indicated that CPAC would consider expanded restrictions on ethnological artifacts, no additional detail was provided. Mr. Knerly indicated such secrecy makes formulating a response virtually impossible. Based on recent expansions of the designated list for other Latin American countries, Mr. Knerly nonetheless guesses that Nicaragua seeks additional restrictions on religious art. If so, Mr. Knerly argues that such an extention would only reward Nicaragua for its failure to create a proper inventory of such religious art. Such inventoried artifacts are already barred from entry without the need to impose restrictions on all such art. Finally, Mr. Knerly also explained that it is difficult to tell restricted pottery from Nicaragua from unrestricted pottery from Costa Rica. He urged CPAC to ensure there are efforts to create an accurate designated list that will make such distinctions clear. CPAC member James Willis (representing trade interests) mused that it might be impossible as a practical matter to create such a list. While I expect the MOU to be renewed, it is possible it will receive greater scrutiny because diplomatic relations with Nicaragua's current government are not all that good. Archaeo-Blogger David Gill reports that there has been a "swell of opinion" against proposed legislation designed to encourage the reporting of hidden artifacts in the Italian public's hands. See http://lootingmatters.blogspot.com/2010/07/italy-swell-of-opinion-against-change.html He is particularly impressed that there are 5,000 members on a related Facebook Site and some 3000 individuals who have signed an on-line petition against the law. In any event, Berlusconi is perhaps even less popular with Italy's academics than President George Bush was with our own. See http://culturalpropertyobserver.blogspot.com/2009/07/archaeologists-demand-investigation-as.html In the meantime, news of the legislation's demise is apparently premature. Although it has been removed as a budget measure, Gill suggests that the Italian Government may still seek to press for the change in the law. Cultural Property Observer has achieved a milestone with over 50,000 hits since I installed a "statcounter" awhile ago. I thank all my readers (whatever their views on cultural property issues) for their interest. I understand from a reliable source that the Italian Government has apparently withdrawn its recent proposal to encourage the reporting of antiquities in private hands. Apparently, the Italian archaeological lobby is just as strong as the American one. The shame is that Italy knows its system is broken, particularly given severe budget constraints, but reform nonetheless remains elusive in the face of determined opposition. In the meantime, Italy remains full of hidden antiquities. The Italian Associazione Nazionale Archeologi (ANA) is up in arms about a proposed law that would legalize archaeological artifacts in private hands that are declared upon payment of a modest fee. See http://www.archeologi.org/web/news.asp?id=609 The last Berlusconi government made a similar proposal, but it ultimately failed due to like opposition from Italian archaeologists. What is different now? Italy, like other Western countries, is facing hard budget choices, and the proposal has been incorporated into other budgetary measures. According to the ANA, this will make the proposal difficult to defeat. Archaeo-blogger David Gill predictably joins his Italian colleagues in condemning the proposal. See http://lootingmatters.blogspot.com/2010/07/italy-un-patrimonio-di-tutta-lumanita.html But, the proposal won't stop the Carabineri's efforts to catch looters. And it will bring objects in private hands to light that would otherwise stay hidden from scholars. Hopefully, instead of complaining, archaeologists will ultimately join the effort to record useful information about any artifacts that are declared. I suspect those artifacts that are declared will be in the hands of otherwise law abiding Italian citizens. Although the ANA claims the proposal will be a boon to the Mafia, I doubt it. Does anyone really think the Mafia would want to declare antiquities to the authorities, particularly if it could lead to futher investigation? In any event, the proposal also undercuts the AIA's claims that import restrictions on Italian cultural artifacts should be continued for another five years as part of the MOU with Italy. And, of course, given the proposed Italian law, the very idea of reversing the current exemption for coins seems even more ridiculous than before. Hopefully, Assistant Secretary Ann Stock of State Department's Bureau of Educational and Cultural Affairs has been apprised of this proposed law and will take it into account as she considers the renewal of the current MOU with Italy. Cultural cooperation can certainly continue without continuing restrictions on artifacts openly available for sale on markets abroad. The finder helpfully did not disturb the large pot that protected most of the coins from the elements so that archaeologists could perform additional studies about the hoard's composition. Presumably, the authorities will retain the most interesting coins for future display after payment of a reward based on market value. The others will then be returned to the finder after recordation, and then sold to collectors. The news again underscores the benefits of the British and Welsh approach to handling common artifacts like coins. This system ensures hoards are recorded, and also that the State only keeps what it can reasonably be expected to care for. As for me, I look forward to the opportunity to purchase one of the coins from the hoard for my own collection. The fact that I will know this coin's provenance will be plus that is its own testament to the wisdom of the Treasure Act and Portable Antiquities Scheme. Addendum: The PAS Blog mentioned in the comments section below indicates that the there are plans for the entire hoard to be acquired by the State and put on display in the new Museum of Somerset. See http://finds.org.uk/blogs/fromehoard/ If so, it will be a loss for collectors but seeing the pot and its contents together will certainly be gain for Somerset museum goers. The blog also has an interesting preliminary breakdown of the hoard's contents. It again suggests that ancient coins did "travel" and that it is wrong to assume a coin was found where it was made. His article takes Italy to task for its lack of foresight and points out that lack of funding and long-range planning threatens not only Italy's historic structures but the prospects for its new museum for modern art as well. Once again one wonders why American archaeologists are pressing the Italian cultural establishment to claim Greek and Roman coins as its cultural patrimony. Collectors in Italy, the rest of the EU and the United States are already displaying, publishing and conserving ancient coins struck in Italy, and all without the government funding that is so difficult to come by these days. Russia has strong political and economic links to Cyprus. These were apparently stronger than any "good will" that may have been generated by the 2007 renewal of the MOU with Cyprus and its extention to common artifacts like coins. July 4th is our Independence Day here in the United States. This year American coin collectors can again celebrate their continued ability to import unprovenanced ancient coins that are also widely collected in Europe and elsewhere. Yet, efforts by the archaeological establishment and cultural bureaucrats both here and abroad have already limited our ability to collect Cypriot and Chinese coins. And, despite almost 2000 comments from concerned coin collectors during the extremely short period allowed for public comment on the renewal of the Italian MOU, there is a real danger that discriminatory restrictions may very well be placed on the thousands of Americans who collect Greek and Roman coins that were struck in Italy well before July 4, 2011, our 235th year of Freedom. So, for us American coin collectors the State Department Bureau of Educational and Cultural Affairs bureaucracy has become in many ways our "King George." Certainly, ECA is high- handed. It acts secretly, even refusing to divulge whether new restrictions on coins will be considered in the context of the Italian renewal. It stonewalls members of Congress seeking information that is to be release under statute. And, in its motion to dismiss in the pending ACCG customs "test case," it has even argued that its decisions are unreviewable in Court. Hopefully, checks on such actions will ultimately come from the political appointees at State, the Courts or from the Congress. Perhaps, the freedom to collect coins is not one of the greatest of our freedoms, but certainly how government responds to concerns about fair process goes to whether our national leaders truly respect the Spirit of July, 4, 1776. The growth of sales of cultural relics within China and the effort to reclaim cultural property from abroad again suggests that nationalist ideology not protection of archaeology is the driving force behind Chinese cultural policy. Sure, some peasants have been executed for tomb robbing, but it remains to be seen whether the new law's provision about the presentation of ownership certificates for art that is being auctioned will have any real effect.